Self-handicapping involves engaging in behaviors that sabotage your chances of success. Why would people do things that might make them more likely to fail? We all want to feel good about ourselves, but researchers have found that we sometimes go so far as to hurt our chances of success in order to avoid taking responsibilities for our failures. When faced with an important exam, for example, students might stay out all night to avoid studying. Then when they do poorly, they can blame their poor scores on their friends for keeping them out late rather than their own lack of intelligence. Simply put, self-handicapping allows people to find an outside source to blame for possible failures. While this can be an effective strategy for protecting self-esteem, it can understandably have a significantly negative impact on success. Let's take a closer look at why self-handicapping happens and the potential outcomes of this behavior. Psychologists have found that we all have a strong need to blame our failures on outside forces while taking personal credit for our successes. This behavior protects our self-esteem, but it can also make us do things that actually make us less likely to succeed. This tendency is known as self-handicapping, defined as a self-sabotaging action or choice that prevents people from taking personal responsibility for outcomes. Essentially, people create obstacles so that any possible failures can then be blamed on these outside forces. Failure can lead to discomfort when people realize that their own lack of skill or preparation led to the outcome. By engaging in actions that undermine possible success, people avoid having to face the truth and accept their own deficiencies. There are many different forms of self-handicapping. Sometimes this behavior can be fairly innocuous, but in some instances, it can be much more serious. In some cases, it might even drive people to engage in the potentially dangerous behavior. For example, students might procrastinate on their homework or put off studying until the very last minute. Athletes might skip practice or stay up late the night before a big game. In some cases, people might engage in more dangerous forms of self-handicapping such as abusing drugs and alcohol. Researchers have suggested that self-handicapping can be linked to what is known as the self-serving bias, in which people claim personal credit for success but blame outside forces for their failures. Imagine, for example, that you have been preparing to compete in your very first marathon. You've been following a training schedule and eating a healthy diet, but as race day approaches, you find yourself doubting your ability to successfully reach the finish line. 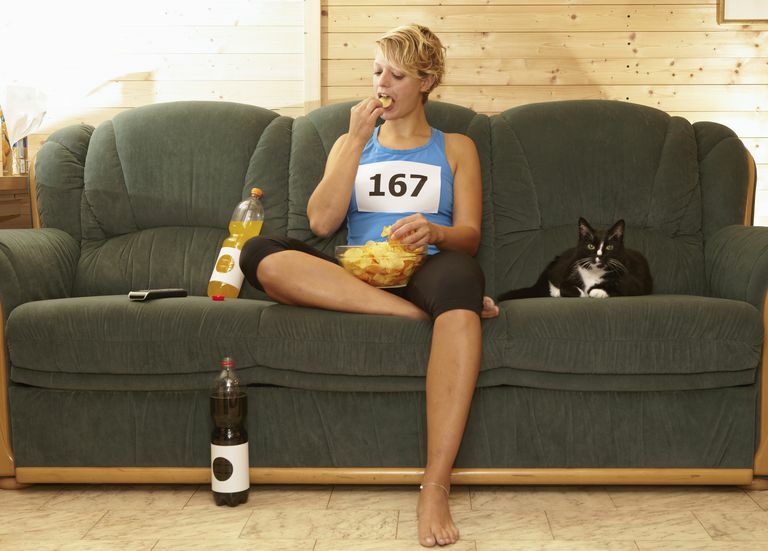 In the weeks and days leading up to the big race, you find yourself skipping your training sessions and binge eating junk food. When the day finally arrives to compete in the marathon, you find yourself feeling sluggish and out of shape. As a result of these self-handicapping behaviors, you are able to blame your inability to finish the race on being out of shape or bloated rather than your possible lack of ability. The phenomenon was first described by researchers Stephen Berglas and Edward Jones in a 1978 study that involved randomly assigning students to complete anagrams, some of which were solvable and some of which were not. Afterward, all of the students were told they had done well. This feedback was clearly unsettling and confusing to the participants who had been given the unsolvable anagrams. They were told they had done well but had no idea how or why they had. “These are the people who are told they are brilliant, without knowing how that inference is derived,” said Dr. Berglas explained to The New York Times in 2009. The volunteers were then asked if they would want to take either a performance-enhancing or performance-inhibiting drug before they took another test. Of the participants, a whopping 70 percent of those who had been given the unsolvable anagrams opted to take the performance-inhibiting drug, compared to just 13 percent of those who had been given the solvable anagrams. Why would some choose the drug designed to impair their performance on a test? These results suggest that when people are confident in their abilities to perform a task, they would prefer to be given something that would help them perform even better. Those who are unsure of their abilities, however, are more likely to want the drug that will hurt their performance, thus giving them an external source to blame for their possible failures. The purpose of all this self-sabotage is to protect the ego and self-esteem, and experts have found that it does actually work. People with high self-esteem have been shown to engage in more self-handicapping. For many people, these behaviors happen almost automatically. We come up with excuses for failure before we've even tried, but we often do so unconsciously. While self-handicapping might go a long way in protecting our self-esteem, it can also have serious negative side-effects. If you are placing barriers to success in your path, there is no way that you are giving yourself all the chances you should for achieving your goals. Not only that, by hindering your chances, you are essentially lowering your expectations for yourself both now and in the future. Researcher Sean McCrea has also found that self-handicapping can lead to lower motivation and less incentive to try to succeed in the future. In a series of experiments, he manipulated participants' scores on IQ tests. Some participants were given the choice to either prepare for taking the test or to join a "no practice" group. Those who then received bad scores were more likely to blame their lack of practice, but McCrae also found in later experiments that those who had an excuse for their low scores (i.e., distractions, lack of preparation, etc.) were less motivated to prepare for a future test than those who didn't have an external source to blame. "The handicap allowed them to say, 'All things considered, I actually did pretty well,'"McCrea told Benedict Carey writing for The New York Times. "And there’s no drive to get better." Students who engage in self-handicapping report spending less time each week studying. Self-handicappers also tend to have lower grades overall. They are also more likely to use alcohol before engaging in a task. It also hurts social relationships. Self-handicappers always seem to have an excuse, so they are often viewed as "whiners." Researchers have found that self-handicappers are rated more negatively by their peers. Self-handicapping can protect the ego, but it comes with significant costs. Placing obstacles to success might provide excuses for failures, but it also makes us more likely to fail. Do you feel good about yourself now or do you give it your all and risk failure? The research suggests that while your self-esteem might take a temporary hit, giving up self-handicapping behaviors might be better for future success. Baumeister, R. F., & Bushman, B. J. (2008). Social Psychology & Human Nature. United States: Thomson Wadsworth. McCrea, S. M. (2008). Self-handicapping, excuse making, and counterfactual thinking: Consequences for self-esteem and future motivation. Journal of Personality and Social Psychology, 95(2), 274-292. Tice, D. M., & Baumeister, R. F. (2006). Self-esteem, self-handicapping, and self-presentation: The strategy of inadequate preparation. Journal of Personality, 58(2), 443-464.